The moment we were seated, we were introduced to Gaetan, the Sommelier and our lead waiter for the evening. A lovely young guy who has such an interesting global background; a mix of French & Scottish and USA in his voice, who resides in Bangkok specialising in German wines in a restaurant on Asia’s 50 Best Restaurants! Cool huh? 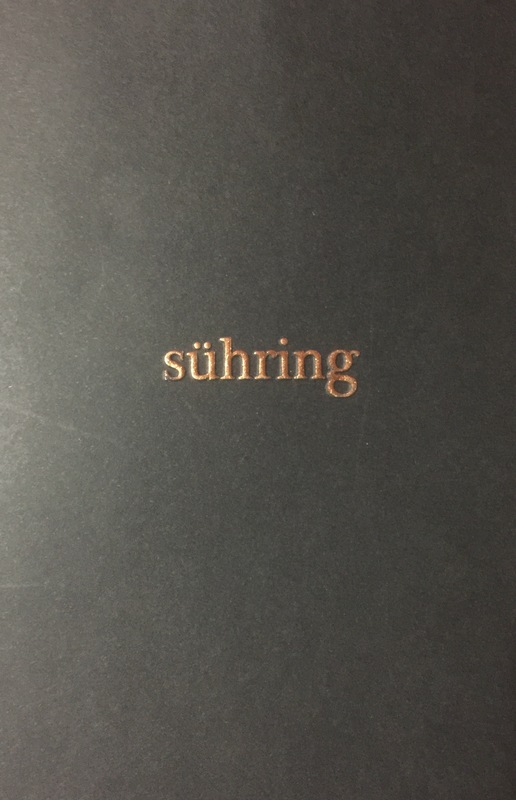 Gaetan explained that Sühring’s wine list focuses on old world wines from cool climate regions such as the Rheinhessen, Pfalz, Burgenland, Alsace and Burgundy. Many of the wines are small artisan producers who specialise in organic and biodynamic viticulture and have interesting stories behind their women and men who make the wines. German wines are beautiful and with so much history, but I find them a bit hard to express due to my lack of German language. So it was fantastic to learn more about them. We had a cocktail each followed by one white wine and one red wine each. One white was a beautifully elegant Grauburgunder (translates to Pinot Gris) by one of German’s best producers Helmet Dönnhoff. The Dönnhoff family have been growing vines at Oberhausen in the Nahe region of Germany since 1750 (located about 100km south-west of Frankfurt). Helmut is regarded as one of Germany’s finest winemakers. The other white wine is possibly my favourite white variety, Grüner Veltliner. Produced by Emmerich Knoll III an exuberant personality for the Wachau wine region (about an hour north-east of Vienna on the Danube River in Austria). Emmerich Knoll is well known for producing a range of beautiful Grüner Veltliners. The one we had was Grüner Veltliner “Loibenberg” Smaragd 2016. It took my joy of this variety to a whole new level! The reds we had were Pinot Noir and Blaufränkisch (German for blue Frankish). The Pinot Noir was a biodynamic Pinot Noir from Alsace by renowned winery Domaine Albert Mann. The grapes for this Pinot Noir were sourced from a very small (2.5 acres) of a walled parcel known as Clos de la Faille. The Blaufränkisch was a luscious, full bodied variety only produced in Austria and Hungary. This wine was by another small producer Roland Velich of Moric Estate based in Mittelburgenland, known as the red wine centre of Austria. It lies near the small town of Sieggraben, south of Lake Neusiedl, and close to the Hungarian border. The Sühring “Erlebnis” (meaning Suhring’s degustation experience). This experience is only available when dining in the kitchen (they have four areas of their house you can dine in: kitchen, dining room, winter garden and living room). We love dining like this observing the kitchen in its full and frenetic best. The Sühring Erlebnis was served over three chapters totalling 13 courses. (Chapter One was five canape style dishes, Chapter Two was five main course dishes followed by Chapter Three of three desserts). Each dish was explained in detail about what it consisted of and how best to eat it. Our favourites included Entenleber & Buchteln (foie gras mousse on a sweet German roll served on top of a flute of Fritz Haag Riesling Spätlese), Spätzle (soft egg noodle) with crispy onion with the optional addition of freshly shaved Tasmanian truffle complete with the white glove treatment. We also loved the Hungarian duck (aged for 7 days served with broccoli and hazelnut). Before we were served the duck dish, we were presented with a collection of exquisite knives to choose from, designed exclusively for Sühring by well known German knife manfacturers, Nesmuk. A real thrill was to meet and chat to Mathias Sühring after our meal. It’s rare that the celebrity chefs are in the restaurant whenever we are booked in. He was really welcoming and after a busy evening of service still seemed calm and up for a chat. He happily signed our menu. His message “Simplicity isn’t simple!” We couldn’t agree more! Being two of only six people in the kitchen watching the precision with which the Chefs craft their dishes and learning more about wines from Germany and Austria was a definite WOW moment. If you are in two minds, like I was, about a dining experienced with German cuisine at its core, then I highly recommend giving it a try. You won’t be disappointed.